The printables for the July Scripture Prayer Calendar for Your Husband and for Your Wife are ready! For July's marriage prayer calendar, I focused on Scriptures from the book of Psalms. Sometimes when praying for our spouse, we don't know exactly how we should pray. That's when I head straight to the Psalms! They are wonderful prayers and praises to God that speak for me when I don't have the words or am having trouble expressing what's in my heart. My friends, there are words in my heart even now that I so long to share with you. Words that tell all that I have discovered since beginning this journey of prayer for my husband. July is the one year anniversary since inviting you all to join me on this journey of prayer for our marriages! 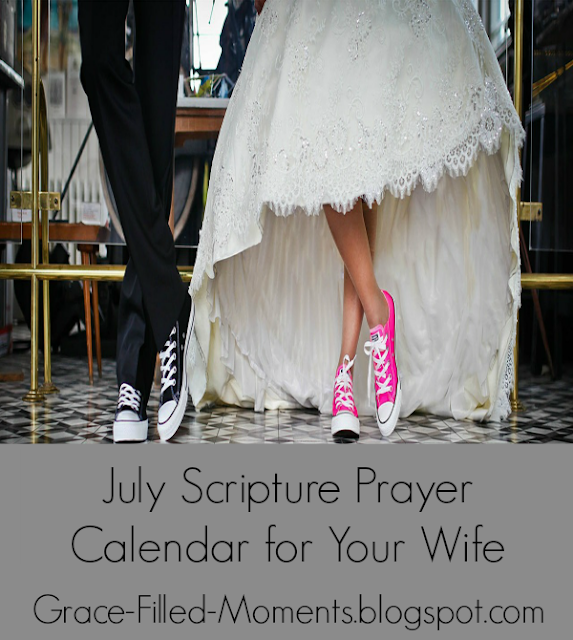 Here's the initial post I wrote announcing about these monthly marriage prayer calendars - Scripture Prayer Calendars for Our Marriages - if you'd like to take a look. I've been amazed at what God has done through this as so many of you have joined me each month and have been so faithful to pray for your spouse too. Prayer is engaging in spiritual battle. God may not always answer the prayers you pray for your spouse in the ways you thought He would. Be ready for the spiritual battle you are engaging in when you commit to pray for your spouse by staying in the Word of God and being intentional in your prayer life. Your prayers may bring things to the surface in your spouse's life that are difficult for you both as you face those things head on together - and with God's help. Do not grow weary...do not grow weary. Trust that God loves you and your spouse and He wants your marriage to succeed and thrive. God can help you to love your spouse as He loves them. Marriage is a beautiful picture of God's love and forgiveness for each one of us. Forgive always as you have been forgiven by God many, many times as well. Thanks for letting me share with you some of the things that are on my heart tonight as we head into another month of prayer for our spouses and our marriages. What has God shown you in the one year that you have been on this prayer journey for your spouse? Feel free to share in the comments below. Know that I'm praying for you, your spouse, and your marriage. Here are the downloads for the July Scripture Prayer Calendar for Your Husband and for Your Wife. Simply click on the images below to download your prayer calendars.